This article deploys an app to App Service on Linux. 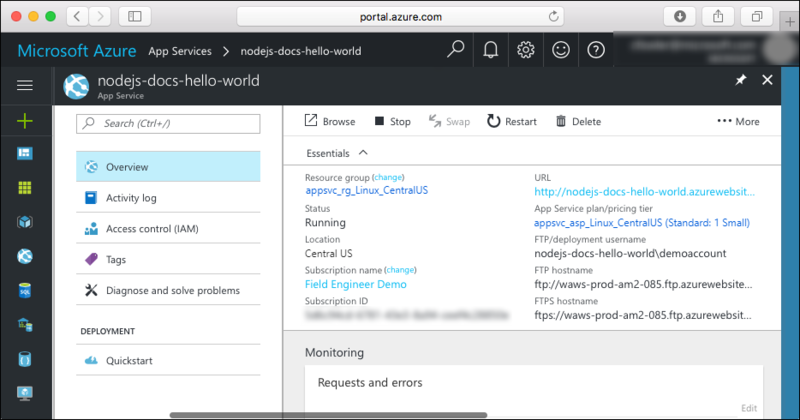 To deploy to App Service on Windows, see Create a Node.js app in Azure. App Service on Linux provides a highly scalable, self-patching web hosting service using the Linux operating system. This quickstart shows how to deploy a Node.js app to App Service on Linux using the Cloud Shell. You'll complete this quickstart in Cloud Shell, but you can also run these commands locally with Azure CLI. In the Cloud Shell, create a quickstart directory and then change to it. Next, run the following command to clone the sample app repository to your quickstart directory. The sample index.js sets the listening port to process.env.PORT. This environment variable is assigned by App Service. Change to the directory that contains the sample code and run the az webapp up command. In the following example, replace <app_name> with a unique app name. Create a default resource group. Create a default app service plan. Create an app with the specified name. Zip deploy files from the current working directory to the app. Browse to the deployed application using your web browser. Replace <app_name> with your app name. The Node.js sample code is running in App Service on Linux with a built-in image. Congratulations! You've deployed your first Node.js app to App Service on Linux. 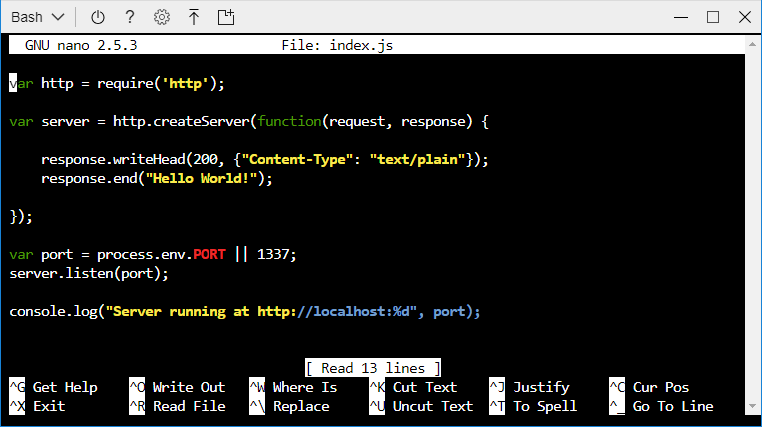 In the Cloud Shell, type nano index.js to open the nano text editor. You'll now redeploy the app. Substitute <app_name> with your app. Once deployment has completed, switch back to the browser window that opened in the Browse to the app step, and refresh the page. Go to the Azure portal to manage the app you created. You see your app's Overview page. Here, you can complete basic management tasks like browse, stop, start, restart, and delete. In the preceding steps, you created Azure resources in a resource group. If you don't expect to need these resources in the future, delete the resource group from the Cloud Shell. If you modified the region, update the resource group name appsvc_rg_Linux_CentralUS to the resource group specific to your app.